Disappointing horror adaptation that has one or two good points but is ultimately let down by a lacklustre script, unimaginative direction and a shockingly bland performance by Ben Barnes. 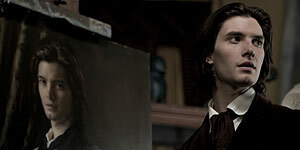 Directed by Oliver Parker (his third Wilde adaptation), Dorian Gray is based on the classic 1890 novel by Oscar Wilde and stars Ben Barnes as Dorian, a wide-eyed orphan who inherits a vast fortune and a sprawling London mansion when his abusive grandfather dies. Somewhat naive in the ways of the world, Dorian is quickly taken under the wing of cynical Lord Henry (Colin Firth), who takes him on a tour of London's vice dens and opens his eyes to the joys of booze, drugs and whores in short succession. When his relationship with a pretty young actress (Rachel Hurd-Wood) ends in tragedy, Dorian hardens his heart and, possibly unwittingly, sells his soul to the devil in exchange for eternal youth. As he continues to whore his way around London, the excesses of his wantonly hedonistic lifestyle appear on the face of a portrait of Dorian painted by his friend Basil (Ben Chaplin), a portrait Dorian quickly decides to stash away in the attic. Colin Firth delivers an enjoyably sleazy, bitterly sardonic performance as Henry and, as such, he's the best thing in the film, though there's also strong work from an under-used Rebecca Hall as Henry's grown-up daughter. The film's biggest problem is Ben Barnes, who's clearly been cast for his looks rather than his acting ability – he certainly looks the part, but there's zero chemistry between him and either of his female co-stars and he's just not a good enough actor to carry off scenes of despair or horror; his wooden attempts at the latter are particularly embarrassing. In addition, the script is surprisingly dull, lacking anything resembling depth or sophistication, while even the lines lifted directly from Wilde seem somehow shoe-horned in. Similarly, the direction lacks any sense of fun or imagination, favouring Gothic atmosphere over suspense or horror; there's also a misguided, frequently repeated portrait POV shot that doesn't work at all. Firth and Hall ensure that Dorian Gray is just about watchable, but the end result is disappointing, thanks to a poorly written script and a criminally bland performance by Barnes.